This replacement wheel fits only to the Powerslide Vi SUV, Vi SUV 2.0, Metropolis SUV and Powerslide Vi Shockliner skates. The diameter of the Roadwarrior wheel is 125mm ( type 5 x 1"). The wheel comes with tube, tire and rim. It does not include the spacers and bearings. The Roadwarrior has a recommended inflation pressure of 5.9 bar. Attention: The Powerslide Roadwarrior wheel fits only the Powerslide Vi SUV and Powerslide Vi Shockliner Skates because of smaller diameter. 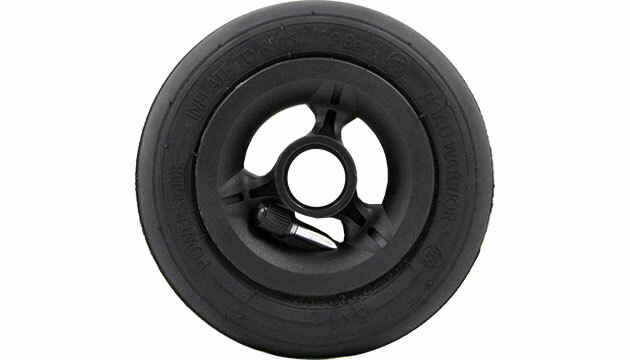 The wheel is only available in Black color.